This offer is for Full Head Colouring, Re-growth Colouring or Half Head Highlights. Beauty elixir for all hair types, with a pure luxuriance that envelops your hair. Three organic natural oils in an exquisite mixture with a pleasant, silky texture, absorbed rapidly and leaving no residue in the hair. You cant afford to miss out! Quote Promo Code: " 25M "
Spring Is Here, Lets get a new look going! Time for a tidy up, a new colour, its time to get some life back into your hair. Have a look at these special offers and lets see what we can do! This month its all about getting the colours of summer back, Now is the time to start thinking of your summer looks. Lets get rid of that winter mop and get trendy again. Quote Promo Code " 25M "
Appointments made without code being quoted will be charged at normal prices. No exception shall be giving afterwards. We reserve the right to with draw this offer at any time. All you need is Valid ID and the discount is yours. Established in 2001, These premisses, was once a former run down Fruit & Vegetable Shop. After finding the right location in Sunderland we new that this place would be ideal. 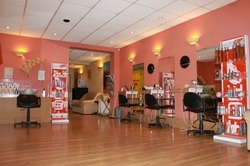 It was going to take a major refurbishment to turn what was a run down one room shop into a salon. Choosing the right building company was the start of the battle After many hours spending time with many Building company's we found one who were local to the area and had won an award for for the Builder of the Year with the Federation of Master Builders. Herod Builders under took this job. From what would we could not imagine we could do with this run down building, they turned it into everything we could have asked for. Since then we have been going from strength to strength building up a vast client portfolio.